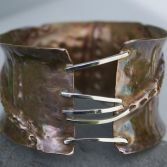 This lovely Fold Formed Textured Bangle is made predominantly of Copper but has a sterling silver detail to add a contemporary look. 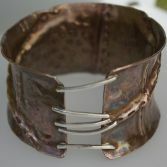 The Bangle is a one of a kind item, as handcrafted by me. A similar one could be made however no two would be the same, the images shown are a good representation of the Bangle you would receive. The bangle's band is approximately 4.5cm wide and the size of this bangle is a medium 6.5cm diameter. Other sizes can be ordered please use drop down option to select size please allow 4-6 days from date of ordering. It has an anti-clastic curve so is very comfortable to get on and off and to wear. 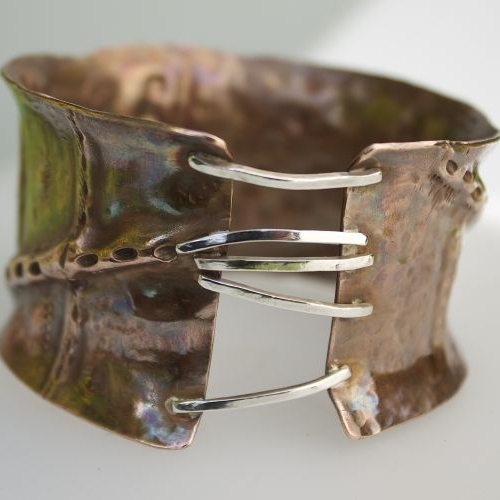 Copper has a beautiful warm quality and is renowned for its healing ability and is worn to alleviate the symptoms of arthritis. 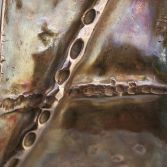 Your Organic Fold Formed Textured Bangle will be presented in one of out signature gift boxes and posted via 1st class Royal Mail recorded delivery (signed for) to any UK address free of charge.